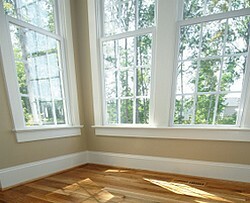 A great way to remodel your home and increase its value and save energy is with a new window installation. Unfortunately, drafty windows and doors can account for up to 25% of your homes heat loss. In an ideal world, we would all be able to replace our drafty old windows with energy efficient low-e ones but that's not the case. If your current remodeling plans or budget don't allow for replacement window and doors, there are some steps you can take to minimize the energy loss. Caulking, weatherstripping, storm panels and even window treatments can all assist in lowering your energy costs. Traditional exterior storm panels are another inexpensive way to reduce heating and cooling costs. A newer trend however is the emergence of interior storm windows. Studies have shown that these panels have a 20 - 25% energy savings as well as reducing condensation. They stop air infiltration just as its exterior counterpart but also provides additional protection. Because they're installed inside, they create an air space between the exterior window and interior storm. By doing this, the interior window tends to be closer to room temperature and therefore making it more comfortable. 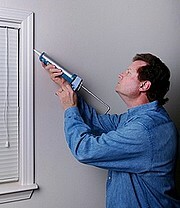 An easy fix is to caulk or add weatherstripping at doors and windows to stop air from infiltrating. There are also a myriad of caulking products on the market to assist depending upon the area and material you are looking to plug up. For cold climates, you can add plastic over the interior of the windows to help keep heat in and cold out. Insulated draperies can help with heat loss and gain. Depending on the type of fabric it is estimated that it can be up to 35%. If you have drafty windows, you should follow the steps above, but also know that you can aid in blocking any air infiltration. 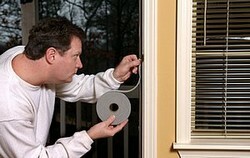 Window shades can serve the same purpose as insulated draperies. In fact, dual shades hung close to the windows may offer even more. Dual shades have a white side (which is highly reflective) and a dark side (which is heat absorbent). Cellular shades can be order with insulation within the cells. This can definitely help with cold and heat, but they are not known for helping with air infiltration. If you are replacing your windows and doors as part of your remodeling project, do your homework. There are many window companies on the market. Be sure you get the most for your money. Depending upon where you live, the properties of an energy efficient window will be different. Look at the National Fenestration Rating Council (NFRC) recommendations for your area. Low-E coatings can deflect the solar glare and harmful uv rays away but will add as much as $50 per window. Argon gas is an inexpensive, non-toxic gas that adds a measurable amount of insulating performance. Double and triple pane windows that have argon gas filled chambers provide enhanced energy efficiency. In addition, high performance windows don't just save energy by keeping out drafts, they also reduce solar heat gain making it easier to cool your home. So again the key is to do research and get the best quality windows and doors your budget will allow.